We now arrived at the task of deciding exactly which packages we want to install. 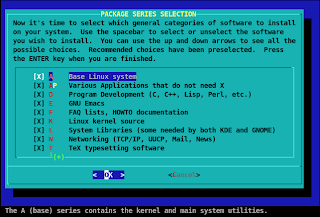 Slackware (and Slack/390) organizes its packages in 'series'. This comes from the old days, when we installed Slackware from floppy disks. With the '+' and '-' keys you can scroll through the list and read the last line on your telnet session for more information. I suggest installing the recommended series and just deselecting the GNOME / KDE and KDEI series if you downloaded them. Select / Deselect a series with 'space'. You definitely should not deselect the 'A' (Base), 'AP' (Applications), 'L' (Libraries) or 'N' (Networking) series. Press Enter when you're satisfied with your selection. I suggest selecting 'full' to avoid problems. Only select 'expert' is you really are an expert. The problems you might create by skipping an individual package are not worth the space you save. In my experience of over a decade as a Slackware user I have seen too many users selecting individual packages running into problems later on. Select your option and press Enter to start the installation! Because this part of installing all packages may take some hours, depending on your host system, available memory, processing power, network connection etc. In my case, with the downloaded files on the host computer where Hercules is running, it took some three hours for a full install. There are some very important steps in the next phase of configuring, so pay attention when the installation of all selected packages is finished. Next post: Configure your installation!